Our biggest fear as an industry is that we will be seen by our colleagues as geeks. The title on my business card says “Chief Information Officer”. The CIO title is considered by many to be the most coveted in the IT industry and typically represents the top IT decision maker in an organisation. I often wonder about the title of Chief Information Officer because as an industry we dwell on technology, not information. We seem to spend more time discussing Blackberry vs iPhone, than we spend talking about information and the use of information to drive performance. Interestingly, as much as we dwell on technology, our biggest fear as an industry is that we will be seen by our colleagues as geeks. We are needed because someone has to keep the computers running, but we are irrelevant to strategy and business decision-making. It is a reinforcing circle. We focus on technology therefore our colleagues see us as geeks. When we do think about information, mainly what we think about is fancy new technology tools not about improved use of information per se. I believe we need to re-balance this, so that we spend our time more or less equally between use of technology and use of information, as our CIO title suggests we should. The question is how? Peter Drucker and Lord Kelvin provide us with a clue to where to start and it is not with fancy BI tools. Step one is to understand your organisation and how it adds value. Step two is to provide accurate, or perhaps more correctly put, consistent and relevant measurement to key decision makers to allow them to optimise business performance. Relevance is the key. The information needs to be relevant to the context of the decision maker. If it isn’t then it doesn’t matter how good the information is, it will not be used. Those who have read a number of these columns, or my blog, will know I believe Abraham Maslow’s hierarchy of needs provides a great analogy to define relevance; in this case relevance to what the decision maker is trying to understand and to guide a journey towards improving maturity. 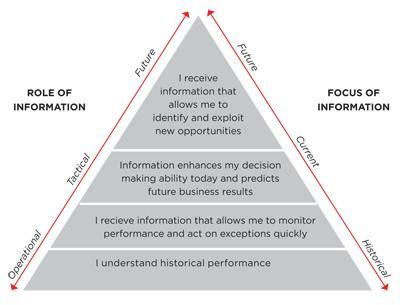 Below is my version of an “Information Needs” hierarchy, to guide an organisation’s maturity in the better use of information.